When should I get started on my wedding invitations? How soon should I book you? The quick answer: sooner rather than later! Invitations are something you can check off your list early in the planning process, so it doesn’t hurt to reach out and get the ball rolling. I’m not here to panic you though— lots of wedding timelines will tell you to get your invitations started 10 months before your wedding day but hello, lots of us aren’t even engaged for that long! As long as your wedding day is at least 4 months out - we can make custom invitations happen! Are you a calligrapher as well as a stationer and designer? What options do you provide for envelope addressing? As much as I love classic calligraphy and all of its elegance, pleeeeease don’t hand me a nib and expect me to be able to do anything with it! 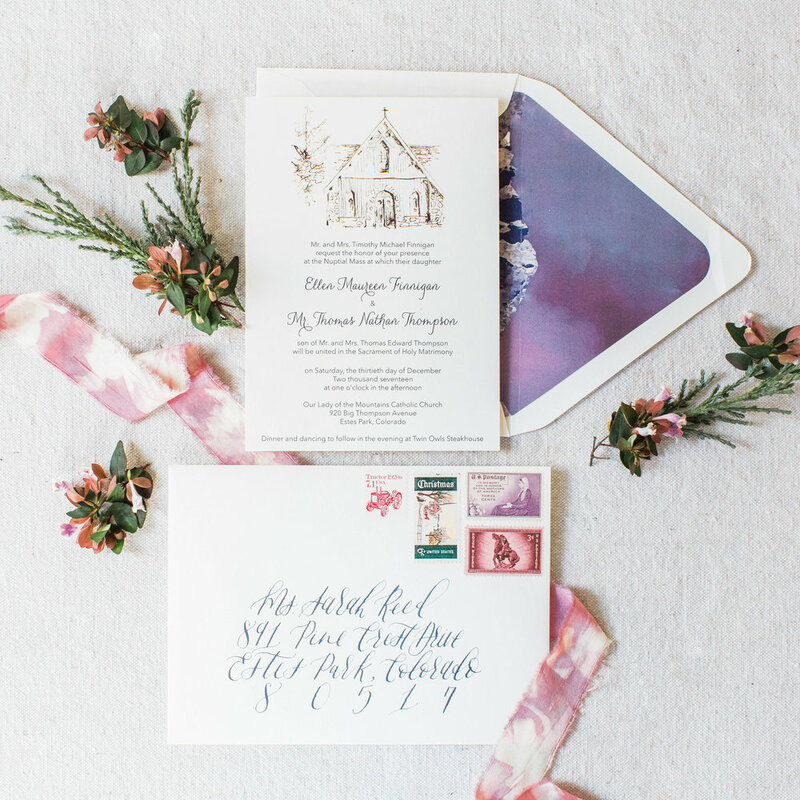 While I’m not a calligrapher, I do work with lots of calligraphy friends—here in Atlanta, or your sweet neighbor who has always wanted to do your addressing!—to coordinate the full invitation suite. I also offer address printing for $1/envelope if calligraphy isn’t in your invitation budget. I’d love to work with you, but I’m not sure if I need everything from start to finish. Can we work together for day-of paper goods if I don’t need invitations? Absolutely! I love working with a bride who wants to put an extra special touch on paper goods for her wedding guests — from welcome baskets, to custom maps, wedding weekend itineraries, ceremony programs and reception signage. If you have an idea, let’s make it happen! How long does your process take from start to finish? There are a lot of variables here, but I usually actively work with my brides for about 3 months. The actual design time takes a few weeks, and the longest part of the process is usually printing. Letterpress printing requires a longer lead time, and depending on what special details you choose—like envelope liners, belly bands, or other fun additions—the timeline for your project is as custom as the invitation itself. I’m still working on my budget—what is a ballpark range for your wedding invitation services? Great question! My basic invitation package, which includes 100 custom invitations, envelopes, a reply card, and reply envelopes, begins at $500. Prices vary widely depending on quantity, design, printing style—digital ($), foil ($$), and letterpress ($$$)—and other add ons (including envelope liners, belly bands, wax seals, ribbons, etc.). If you’re ready to chat more about pricing, I recommend you looking into booking a consultation with me. PS: The deposit for your consultation will go towards your wedding invitations, and after your consultation, I’ll send you a personalized quote that we’ll walk through together! Is it okay that I don’t live in Atlanta? Yes! In the last year, I’ve worked with clients in South Carolina, Chicago, North Carolina, Virginia, Texas, and Boston. 95% of our communication will be done via email—which makes your life easier because I know how much you have to juggle as you plan your wedding and live your life! Do I really need a reply card? Can’t I ask my guests to RSVP online? This isn’t a hill that I’m going to die on, but I always advise my brides to include a traditional reply card and *stamped* reply card envelope. You only get married once. This is your wedding, not a house warming party so leave the electronic RSVPs for your next Paperless Post get together. What information is typically included on a details card? A details card is the perfect place to remind guests of the most important information about your wedding weekend, and to leave any special instructions they may need. Is parking a little tricky? Should they arrive early to the ceremony? Are they invited to a Sunday brunch at grandma’s house? Brides typically include hotel accommodations, their wedding website, and gift registries. Does wedding stationery actually matter? Yes! You probably think I’m obligated to say this, but I really do believe that your wedding invitation will be one of your most special heirlooms from your wedding day. Think of your invitation as a sneak peak—the very first thing your guests see from your big day. Set the tone and invite them into the joy of your celebration.